Event horizon is the term used for a boundary in space time beyond the point where events are not able to affect an outside observer. Now, if like me, you've not got a PhD in Astrophysics then it might be best to just say that 3D slots developer Betsoft Gaming have launched a space-themed slot by the same name. You can put the Dummy's Guide to NASA book down now. 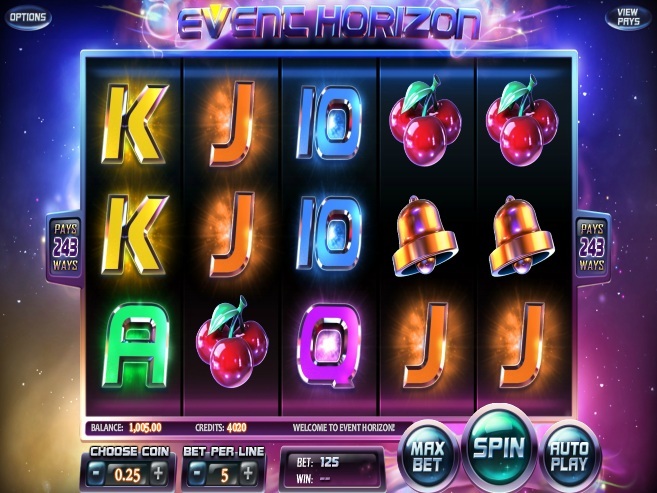 This Event Horizon slot is a 5 reel, 243 ways to win title that, ironically, is actually not one of Betsoft's visual masterpiece 3D slots. Instead we are handed sub-par graphics that take us into space. The concept of event horizon is not even used within the slot. Although in all fairness to Betsoft I am not actually sure how that would be possible. Plus, if you've seen the iconic 1997 hit movie of the same name starring Laurence Fishburne and Sam Neill then I think we're all a bit better off if things stay that way! On a sidenote, if you played Betsoft Gaming's Mega Gems slot then the general feel to the reels is very similar. It is possible to win up to 144,000 coins on this slot. A random figure but nonetheless it is one not to be sniffed at. Symbols on the reels are a hark back to the classic slots era. There is the number 7, a bell, cherries, one BAR, two BARS, three BARS, and the regular 10-through-to-Ace symbols that fill up the positions on the reels. The orb acts as the Wild on this slot. It substitutes for all other symbols to help you complete any winning combinations that might be possible across the reels after each spin. This can lead to some great wins. This slot also comes with a Sync Reels feature. Every time the reels are spun, two or more reels chosen at random will sync their spin and will land on the same symbols. Yes, that's right, two or more meaning that potentially all five reels could become synced. That can result in a lot of winning combinations and some huge payouts. Please note that Sync Reels can only occur with connected reels. For example reels 2, 3, and 4 might become synced but reels 1 and 5 cannot become synced. 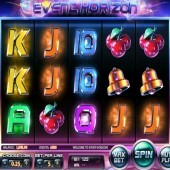 Unfortunately, Event Horizon does not have a free spins bonus round but the Sync Reels feature is an intriguing inclusion. It does mean that there is potential action on every spin but, and I might sound a bit spoilt saying this, it got a bit repetitive and dull after a while. I wanted more from this slot. Space is such a fantastic arena for slots. NetEnt's Space Wars slot is one of my favourite slots to play and Space Race from Play'n Go exceeded my expectations. Visually this slot is well short of what we expect from Betsoft Gaming and that could be down to them being involved with Evolution Gaming for this title. No offence Evolution Gaming! Sadly, it also lacks on the gameplay front and it has wasted the use of a decent feature with the Sync Reels.